The two-paragraph statement released by Leach, who leads the House Committee on Judiciary and Civil Jurisprudence, outlined that he does not believe women who seek to have their babies murdered by an abortionist should be criminally responsible for their actions. “I have always been on the front lines in the fight for the sanctity of life, both personally — through my active involvement with pregnancy resource centers and pro-life ministries — and as an elected official, where I have authored and supported some of the nation’s strongest laws,” he said. “My commitment to advancing the pro-life cause is stronger than ever, and that’s why I cannot in good conscience support House Bill 896 — legislation that subjects women who undergo abortions to criminal liability and even the possibility of the death penalty,” Leach continued. The bill, also known as the “Abolish Abortion in Texas Act” and introduced by Rep. Tony Tinderholt, R-Arlington, declares that life begins at conception, and grants the unborn the same rights that are entitled to born children. “A living human child, from the moment of fertilization upon the fusion of a human spermatozoon with a human ovum, is entitled to the same rights, powers, and privileges as are secured or granted by the laws of this state to any other human child,” it reads in part. During Monday’s hearing for the bill, Rep. Victoria Neave, D-Dallas, remarked that the legislation would result in women being convicted of murder, and they would thereby face the death penalty. She characterized the bill as killing women, and found it to be counteractive to the goal of ending murder. Neave had been among other Democrats who released a statement opposing a separate bill not relating to Tinderholt’s offering that requires abortionists to provide care for aborted babies born alive. According to the Statesman, Neave and others skipped the March 25 hearing for the Texas Born-Alive Infant Protection Act altogether. “I’m okay with justice being served in a court of law,” he replied. Chairman Leach stated that he opposes abortion, but indicated that he was similarly wrestling with the idea of punishing the woman, especially in regard to whether women who are pressured to obtain an abortion should face punishment. Leach quoted from the Book of Jeremiah, which states that God knew Jeremiah in his mother’s womb. Leach also read from Dixon’s website and pointed to a ministry that Right to Life of East Texas supports, which offers post-abortion assistance. He asked Dixon how he could support H.B. 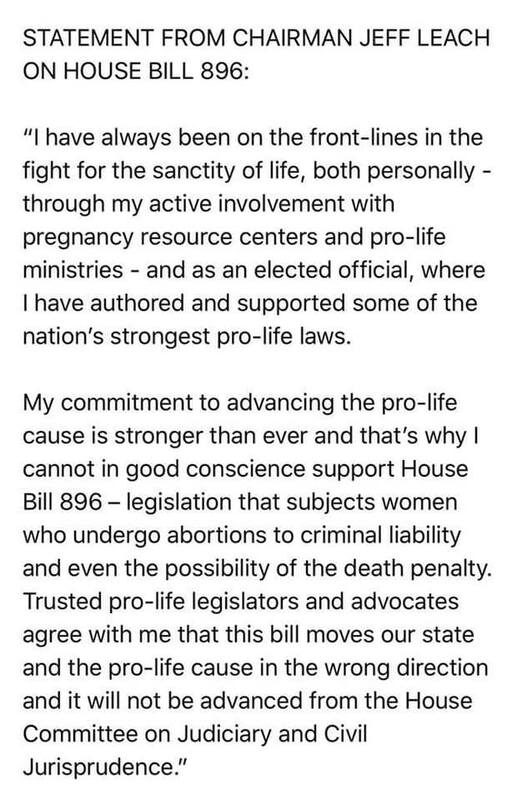 896, which would make the commission of abortion a crime, and yet refer women to CARE for post-abortion counseling services. “What about women who are trafficked and coerced into having abortions?” Leach asked moments later. “What do we do with those women? Because under the bill, a woman who is coerced and trafficked and driven by her pimp to an abortion clinic without a cell phone, with no freedom whatsoever, and is walked into an abortion clinic and said, ‘You will get an abortion,’ [she would be charged],” he claimed. “For a woman who is coerced into having an abortion … The text of the bill is very clear: A woman who ends the life, which is recognized under this bill is — as Representative Neave has correctly pointed out — potentially liable for capital murder,” Leach continued. It is not clear where Leach obtained the notion that the woman would be charged in such an instance, or how the situation would occur. Under the bill, abortion would be illegal, and there would be no abortion facility for the woman to enter. She would have nowhere to go and no abortionist to turn to. The bill also states that the homicide charge would apply to the mother if there was murderous “conduct committed by” the woman — in other words, the commission of a self-abortion, where she personally kills her own baby. 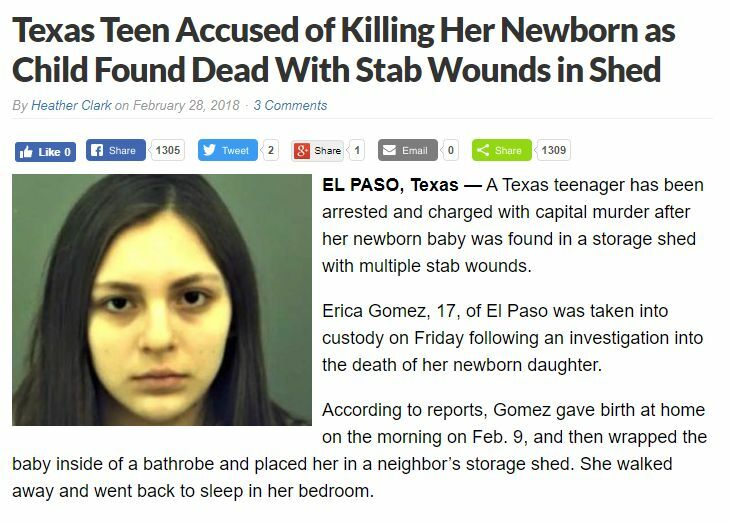 In Texas, women who kill or commit crimes against their newborn baby may be, and have been, charged with murder. Months later, another mother was charged with attempted capital murder after giving birth at her place of employment, placing her newborn son in a garbage bag and walking him out to the dumpster to leave him for dead. Read the reports here, here and here. While a mother may be charged for killing their child even seconds after exiting the birth canal, Texas law prohibits women from facing any criminal penalties for intentionally harming or killing their baby in utero. Tinderholt’s bill sought to correct this allowance, as well as that under current criminal homicide law, and a number of residents who testified on Monday urged Leach to let the bill advance as is. 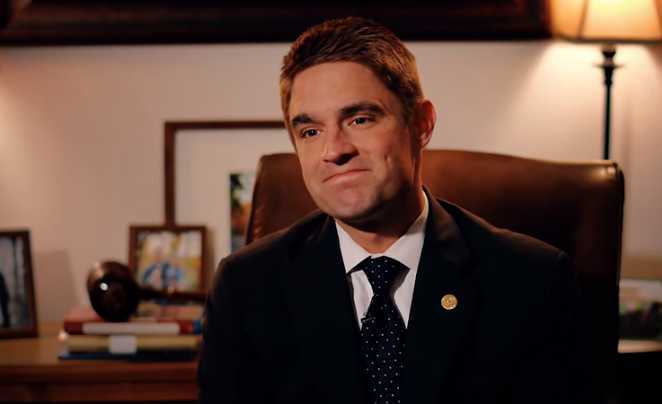 Rep. Tinderholt posted a statement to social media on Wednesday outlining that he believes his bill is being “mischaracterized,” as all his bill does is close up the current allowance for doctors or mothers to perform an abortion without penalty. “Section 1.07, Subsection 26, of the Texas Penal Code already defines an individual as ‘a human being who is alive, including an unborn child from fertilization until birth.’ However, Texas law provides two exceptions to homicide for a mother or a medical professional who performs an abortion,” he noted. “Some think we should exempt mothers, but that would inherently treat unborn children differently than other people who are murdered,” Tinderholt said. “None of those instances would result in any penalties whatsoever,” Tinderholt stated. Christian News Network reached out to Chairman Leach’s office earlier today, but was not able to obtain comment prior to the release of his statement, nor has a response been received by press time. Among the questions sent to Leach were whether or not he considers a baby in the womb as a person deserving of the same rights and protections under the law as a born child, and why he believes that there should not be any criminal culpability for a mother taking the life of her unborn child as opposed to a newborn. A number of residents have now left messages of deep disappointment under Leach’s announcement and elsewhere. “It’s not graceful to say abortion is murder and then turn right around and demand that an exemption from punishment be granted to the murderer. That would literally be delusional,” wrote Polk County GOP. “Please clarify how you will end abortion without criminalizing women. We cannot criminalize the makers of coat hangers. All this does is perpetuate the exploitation of women because they’re exempt from the law,” also remarked Bruce Kendrick. “[U]nder this law, if he had the guts to pass it, then there would BE NO facilities for the filthy dogs who are trafficking women and coercing the abortions to take them,” wrote Craig Licciardi. “HB 896 criminal liability is the same as HB 948 in that YOU CO-AUTHORED in 2017! Now you alone have the opportunity to advance a bill that you [sponsored] 2 years ago and you simply wilt under the fear of man,” lamented Mark Einkauf.